Just a note for those subscribed by e-mail–I’m having to upload the entry several times to get all the pictures included, so you might want to click through to make sure you are reading the final version. Today Leo woke up and was disappointed to see that he wasn’t back home with his foster family. He is very stoic though, and has only had a few periods of crying today. Mostly he looks forlorn, sad, or confused. We got him down to breakfast and he ate a bowl of congee (the Chinese version of oatmeal, made of rice cooked down to a porridge consistency), some steamed buns, and fruit. We tried him on two different kinds of fruit that he made a face at before I remembered the picture we had of him with the watermelon. Mary Evelyn handed over one of her pieces and he ate it right away. 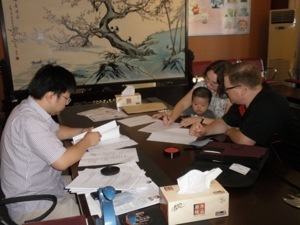 After breakfast, Matt and I met Denise in the lobby to go back to Civil Affairs to finalize the adoption. Leo is still very curious, and looks around at everything as we are driving. Finalizing the adoption took a surprisingly short amount of time. We left the other children back at the hotel with Linda thinking we would spare them an hour of tedious paperwork but apparently international adoption involves fewer signatures than buying a house. Leo loved getting his red fingerprint stamped on the paperwork. We got him an extra piece of paper and let him stamp all over it. He was very excited to see the orphanage director and her associate again. It was great to see his real personality as he laughed and played with them, giving them hugs and kisses. He even gave Matt and I a kiss when they told him to. But it was hard on him when they left again. We had worked out a schedule for the week with Denise. 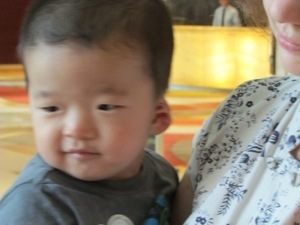 We would like to visit his orphanage in Lianyungang, which is a 4 hour drive. Denise has now gotten us permission from both the civil authorities and the orphanage director. We had another optional trip, which Denise said she doubted we would want to do if we visited the orphanage. For the visit, we have to pay a fee which will cover a van rental, driver, and having Denise for the day. The other trip is basically the same. She said “You see lake, there water and trees. I think you see these at home before, right? I think you not want to pay if you go to the orphanage.” We agreed, but I asked if there were other things we could see within walking distance of the hotel. 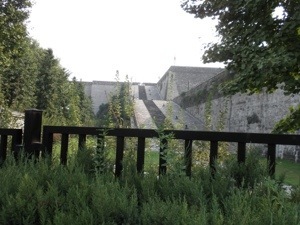 She said that she would return to drop off the adoption decree and we could walk to see the city walls at that time. 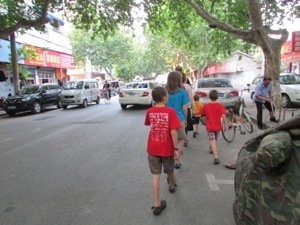 Then tomorrow morning, we will walk to the Confucius Temple area, which is a kind of touristy pedestrian park area. We came home and let Leo take a nap, then met Denise again at 3 pm. Denise warned us that it would be a 15 minute walk, and worried that Vincent might get tired. We tried not to laugh at her too much. Which reminds me of a story I didn’t tell you about Sunday. When we were in the Beijing airport, we stopped next to one of those moving sidewalks to use the restroom. While we were piling our stuff on the floor, Vincent reached up and grabbed onto the moving handrail, tucked up his feet, and let it carry him a few feet down from us while giggling his head off. He did not appreciate Matt plucking him off the conveyor belt and stopping his fun. Anyway, we put Leo in the ergo carrier, which he loves, and walked to the city walls. If we had any idea how many intersections we needed to cross, we would have just gone to walk in the nice sedate mall some more. But no one died. The city wall was very impressive. 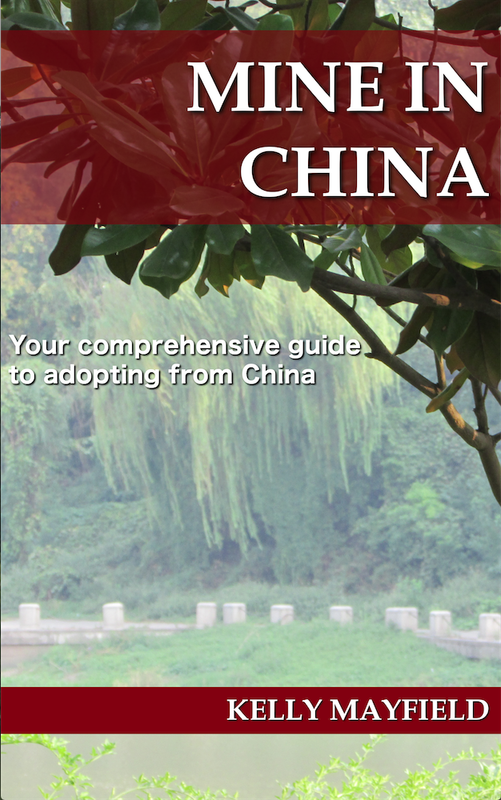 Denise said that it was built about 600 years ago by the Ming emperor who eventually moved the capital to Beijing. She said he required the craftsmen to sign their name on each brick to insure the highest quality of the bricks. There was even a large ramp so that they could bring horses to the top of the wall. We then walked to a riverside park and followed the wall along the river for a while. We saw many people relaxing. If we were a spectacle before as the crazy white family with four kids, we are even more of one now that we’re the crazy white family with four kids and a Chinese baby. People would call out to each other to turn around and look so no one would miss us. Several people asked Denise questions. But everyone is very friendly and good-natured, so we haven’t been bothered by the attention. 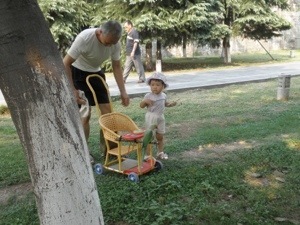 We met a grandfather walking his 18 month old granddaughter who had a bird perched on her stroller. When we reached the end of the river walkway, Denise said that we should go back a different way, since we had gone so far. We followed her along through the backstreets of Nanjing. 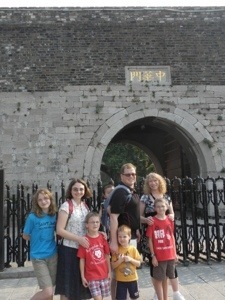 It was similar to our hutong tour in Beijing. We saw so many little shops where the owners had children playing out front next to where their laundry was hanging. People gathered to smoke and play cards. People were walking dogs, or riding bikes, or talking to neighbors. It was really a lot of fun at first, but the walk went on and on. Denise let us through one street after another. There weren’t really any crazy street crossings taking this back way, but often she preferred to walk in the street when a perfectly good sidewalk was available, so there were always motorbikes and the occasional taxi zooming pack. Finally, a good two hours after we started off on our walk, we made it back to the hotel. Denise even took us to a good restaurant across the street which was cafeteria style (tonight’s total was $10) and helped Matt to order before she headed home. After supper we came back to the hotel and gave Leo his first bath. He finally perked up a bit and started to play with the children again. He’s been clinging to either me or Matt all day and not as interested in playing with them. As bedtime approached, he started to sag and make this little grunting noise he makes when he’s trying not to cry. He lost his battle and started to have another good cry. I just patted him and said soothing things to him. We know he misses his foster family. It is great that he likes me and Matt and lets us hold him, feed him, and care for him. That means that he will build a strong attachment to us. But it will take time. The children are doing well with understanding why he is sad. Vincent came over to pat his back and tried to comfort him by saying “You know, I was about your age when Mama and Papa came to get me, too.” The orphanage visit on Thursday might be hard for him, but I hope it will also help him to have some closure, too. Being able to see everyone one last time and say goodbye can be important, even for a little guy. This entry was posted in Uncategorized and tagged China trip 2013, Leo on September 3, 2013 by minefam.